Low Emissivity or “Low E” glazing has become a popular choice within the building industry over the last few years. This glass maximises a buildings’ insulation so that you stay cooler during summer and warmer in winter. 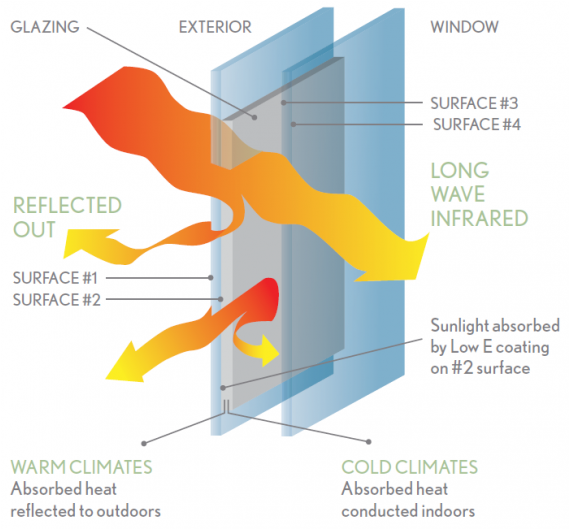 At Nu-Line windows we are advocates for environmentally sustainable options and this is why we recommend Low-E glass to those looking to save money on heating and cooling while helping our planet. There has been an increasing awareness of the role in which windows can help achieve the required energy level rating of a house. The way in which this unique glass works is through a special coating added to one of the glass faces. In a double glazed unit, counting from the outside, the coating is generally located on surface #2 facing inside to maximise performance in our warmer climate. Shown above is the positioning of the Low-E coating and the effect it has on the sun’s rays. The coating cuts unwanted incoming long wave radiant heat from entering the building but also absorbs heat conducted indoors from heating units therefore cutting energy costs. Don’t worry about any light lost from your home; Low-e coatings have been developed to minimize the amount of ultraviolet and infrared light that can pass through glass without compromising the amount of visible light that is transmitted.